Daniella Corporan, Vindhyasree Rapolu, Muralidhar Padala. OBJECTIVE: Mitral regurgitation(MR) is a common valvular lesion, which imposes volume overload on the left ventricle (LV) and drives its remodeling. It is hypothesized that MR induces early increase in LV compliance but later fibrosis and stiffening. In this study, we sought to develop a rodent model of MR and investigate changes in LV mechanical properties over time. METHODS: 22 adult rats were assigned to two groups, severe MR(n=8) and sham surgery(n=14). MR was induced by piercing the anterior mitral leaflet with a 23G needle, on a beating heart with echo guidance(Fig.A1-4). In sham the needle was introduced and withdrawn, without any valve damage. Some rats were survived to 2 weeks and others to 10 weeks, invasive pressure-volume loops were measured, and equibiaxial-mechanical testing was performed on the LV (Fig.C1). RESULTS: Severe MR was induced in all MR rats. 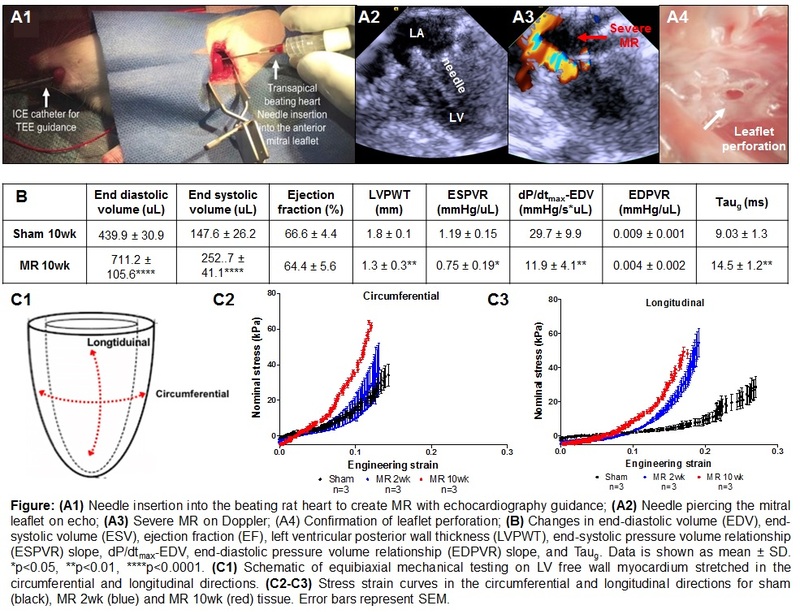 End diastolic volume(EDV) and end systolic volume(ESV) were significantly higher in the MR group at 10wks compared to sham (p<0.0001,Fig.B). LV posterior wall was thinner compared to sham (p<0.01,Fig.B). At 10wks, load-independent parameters of contractility showed decreased ESPVR slope (p<0.05,Fig.B) and dP/dtmax-EDV (p<0.01,Fig.B) compared to sham. Taug, a parameter of diastolic function, was increased compared to sham (p<0.01,Fig.B). At 2wks, myocardial stiffness in the circumferential direction remained unchanged compared to sham(Fig.C2), but was increased in the longitudinal direction (Fig.C3). At 10 weeks, stiffness was increased in both directions compared to sham(Fig.C2-3). CONCLUSIONS: In this rodent model of severe MR, LV was dilated and thinned by 10wks. Despite preserved LVEF, myocardial contractile and relaxation properties were preserved, and myocardial stiffness increased. These results highlight structural and mechanical alterations in the LV in response to MR.